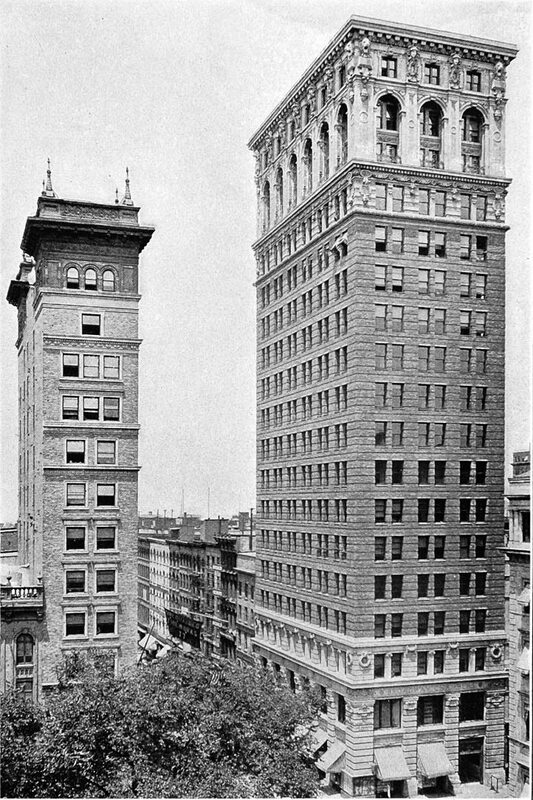 In 1900 the Broadway Chambers Building towered above Broadway. Before Cass Gilbert would design early 20th century Manhattan structures like the Gothic-inspired Woolworth Building or the monumental U. S. Customs House, he would turn heads with a colorful early skyscraper—the Broadway Chambers Building. Construction of new office buildings was booming along lower Broadway in the last years of the 19th century. The land at the corner of Broadway and Chambers Street was owned by the Andrews family of Boston when, in 1896, Edward R. Andrews expressed interest in improving the corner with an office building. Ohio-born architect Gilbert was living in Minnesota at the time and had already made a name for himself in the Midwest. But that particular year one of his designs, the Second Brazer Building, was just being completed on State Street in Boston. One of the building’s financial backers, attorney Alexander S. Porter, was impressed by it and introduced the architect to Edward Andrews. After three years of talking, the pair signed a contract in March 1899 for what would be known as the Broadway Chambers Building. Gilbert knew what he wanted for the soaring new office building—a richly-ornamented structure in the Beaux Arts style made madly popular by the 1893 Columbian Exposition in Chicago. The Exposition was responsible for an sudden profusion of monumental marble or limestone buildings dripping with wreaths, fruited garlands and classical figures that would last for over a decade. Such was the building Gilbert presented to Andrews. But, perhaps to the architect’s surprise, Andrews had his own ideas about what he wanted in an office building: color. Three stories of rusticated granite, interrupted by a cornice between the second and third floor, supported the upper two portions of the buildings. Carved wreaths, garlands and blank panels embellished the lower section. Gilbert brought in bricks for the 11-story central portion from his hometown of Zanesville, Ohio. Produced by the T. B. Townsend Brick Company, they were laid to mimic the rustication of the granite below. The upper section exploded in color and ornament. Using terra cotta elements created by the Perth Amboy Terra Cotta Company of New Jersey, Gilbert encircled the 15th floor with a foliate band. The upper floors were lavished with colorful garlands of flowers, and below the cornice were enormous heads of Mercury, lion heads at the corners, and hanging fruit. Even as the building was rising, Gilbert began marketing it. He hired Hughson Hawley to do a rendering of the proposed structure and presented it at the annual exhibition of the Architectural League of New York. In the meantime, George Fuller created two 11-foot models—a steel model of the framework and a plaster model of the finished structure—to be shown at the 1900 Paris Exposition. Along with the models Fuller exhibited full-scale replicas of architectural elements. Tenants began arriving in April 1900, lured by up-to-date amenities not found elsewhere. Every floor had a mail-chute, almost every office had a sink with running water for washing hands and cleaning up, and there was an independent electrical lighting plant when the reliability of electrical service was unreliable at beset. Several insurance companies were among the first tenants, including The Peoples Security Company in 1901, and Frank F. Eagles, an agent for the Aetna Life Insurance Company who occupied room 1106 in 1907. As the cooperative movement sweep Chicago and New York in the early days of the century, triggered by the socialist and communist ideals, W. M. Brownell formed the Manufacturers Purchasing Corporation and opened his offices here in December 1916. He established a cooperative of “the most successful manufacturers in the candy, chocolate and ice cream” industries, according to The International Confectioner magazine. By paying “a small fee” members could buy their food ingredients at much lower prices, obtained through the group-buying rates of the coop. 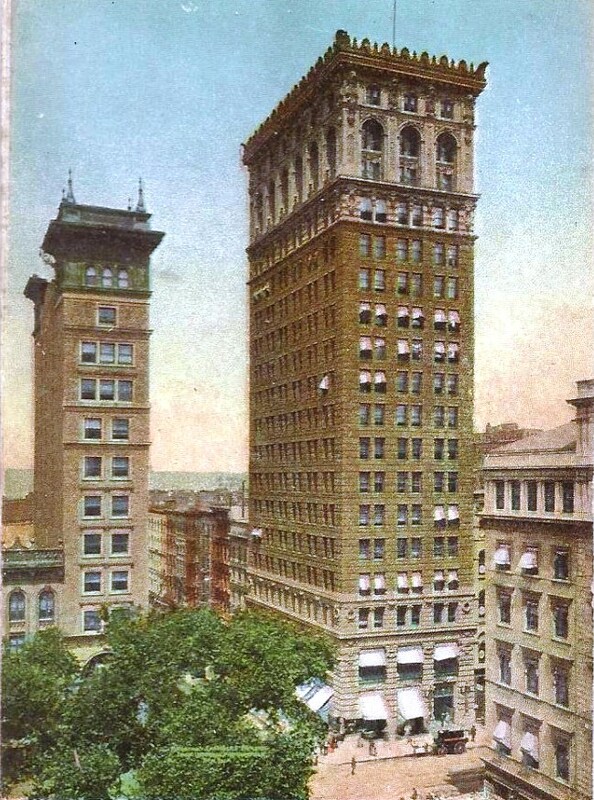 The Broadway Chambers Building was designated a New York City landmark in 1992. It's my dream to see the place myself. Such a wonderful place on earth. Great architecture ..would love to visit this place once.